The history of Euro-Sportring is a history of people - men and women, boys and girls, of all ages in tracksuits or business suits, all united by their love of sport. 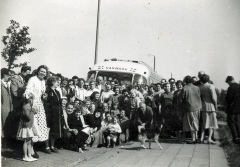 Our organisation was set up in the fifties at a time when Europe was still recovering from the Second World War. The continent had suffered from widespread devastation and almost everything had to be rebuilt. At a time when people were faced with the aftermath of war and economic malaise, a Dutchman came up with the idea of organising an international sport meeting - a table tennis tournament between sports friends from the Netherlands and Germany. Why did I do it? I just couldn’t help it! So said George Oudt, the mentor and founder of Euro-Sportring. Motivated by his own experiences and by the idea of bringing people of different nationalities together through sport, he organised in 1951 the first sport exchange. Ten coaches full of table tennis players from all over the Netherlands travelled to Saarland in Germany to meet their fellow table tennis players. 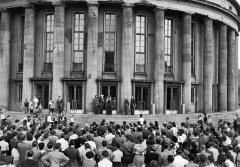 A year later, the German teams returned the visit. Euro-Sportring began with table tennis, but it rapidly became clear that there was a far greater need for international contacts when it came to football. Working from an attic somewhere in Amsterdam, the first members of the organisation did a great deal of groundwork. Every time there was an inquiry about the possibility of an international sport exchange, they took the trouble to locate carefully the right foreign club or association. By 1960, the international network of volunteers that had been set up with so much passion and patience needed to be given a more concrete form. This led to the birth of the Euro-Sportring foundation as an official, non-profit organisation with the mission of bringing the young people of Europe together on the playing field. Right from the start, the sports associations favoured this initiative. The Netherlands, Denmark and Germany formed the basis of the organisation. In the sixties, they were joined by Austria, England, Norway and Spain. Before long, 50 volunteers were devoting all of their free time in building up the organisation, united by their passion for sport, their talent for organisation and their extensive knowledge of the local sports scene. In those days, the sport exchange was also a summer holiday for most of the participants, who were the guests of foreign sports friends for a week. The programme consisted of a few matches and many happy hours in the clubhouse or community centre. In the early years, the participants stayed with the members of the host association. This meant that the foreign guests sometimes had to sleep on the sofa. If a couple came to stay, the host family would sometimes give up their own beds. As a result of these visits, close personal ties and friendships were developed. The ties were renewed the following year when the host association returned the visit. This ‘obligation to reciprocate’ on the part of the visiting teams originally formed the basis of the Euro-Sportring programme.‘Some lads ended up sleeping in baths, but we made sure they were comfortable baths’ Norman Matthews, England, volunteer area Oxford. In the 1970s, people were not so keen anymore to spend their summer holidays with foreign host associations. Instead, there was a need for tournaments in the spring, preferably over a spring weekend. However, the capacity of host families was not sufficient to meet the demand for the tournaments, so this type of accommodation gradually disappeared. The main objective of Euro-Sportring is to enable as many sportspeople as possible to meet up on the pitch. In the endless search for affordable accommodation, from the end of the 1970s schools were enlisted and classrooms were converted into sleeping quarters for participants on a small budget. Those with more money to spend were accommodated in youth hostels and hotels. The operational activities continued to expand. Euro-Sportring now encompassed virtually the whole of Western Europe, as well as a number of countries in central Europe. Euro-Sportring grew very rapidly between 1960 and 1980. In 1960, approximately 60 associations from various countries crossed the borders for a sporting adventure. The number increased up to 275 associations by 1970. Ten years later, the number quadrupled once more till over a 1,000 associations. At the end of the 1970s, Euro-Sportring staged its first major tournament. What had started out as an activity involving modest tournaments with one or two categories and a limited number of teams now became a comprehensive programme with a whole range of international events. Since 1985, the continual expansion of the tournament programme has been the main priority. New tournaments are added every year, and every year there are record numbers of participants. At the end of the 1980s, Belgium and Italy joined the circle of host countries. By the mid-1990s, 5,000 teams were taking part in 80 tournaments in 12 different countries. Over a period of more than 40 years, the handful of people that stood at the cradle of the organisation evolved into an international network of thousands of volunteers. In 2005, players and coaches of 8,000 teams from more than 30 countries taking part in some 140 tournaments have discovered that over the years one aspect of Euro-Sportring has remained constant and true, and that is the enthusiasm for sport and the mission to bring people of diverse cultures and from other countries together. Right from the start, the development of Euro-Sportring has been closely associated with social developments. Hence, the opening of the borders of the former Eastern bloc in the 1990s was immediately reflected in the programme of Euro-Sportring. The response from the Czech Republic was particularly impressive; since 1991, the country has been increasingly featured within the Euro-Sportring programme. In 2005, more than 10 tournaments were held in the Czech Republic with more than 500 teams from approximately 20 countries taking part. Since the 1950s, the countries of Western Europe have forged stronger ties with one another and international contacts are now almost taken for granted. As far as Euro-Sportring is concerned, its greatest challenge still remains l to expand this amicable international cooperation and by doing so, to push back frontiers and remove barriers.